A farm at Bowna, near Albury. At school age I helped out on the farm. I worked at ANZ bank and was a secretary for two solicitor’s firms in Wodonga, Victoria. I was born Dragoslava Stojanovic, everyone calls me Draga in Australia. I was born in a village called Rtkovo near the Danube [River] in Yugoslavia, now Serbia. We left my birthplace in 1939 as there were rumours that Hitler was going to attack Yugoslavia. 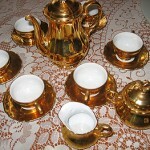 I was an only child and nearly three years old when we left Rtkovo, so I don’t remember a lot of details about my home. My grandmother was the village midwife and she delivered me. We were a happy family; my father told a lot of jokes and I remember singing, wonderful singing. My father was in the Yugoslav Merchant Navy and families were allowed on the barges and the ships with the sailors. We travelled down the Danube to different countries – Czechoslovakia, Hungary and so on – and when the war began and Germany attacked Yugoslavia, we were already on our way to Russia. During our travels we were bombed but luckily were not hit. Once we arrived in Russia, we were interned there for nine months. We were guarded and could not move freely [and] were housed in different apartments. There were about 100 of us altogether. All the families put some money in and we sent a telegram direct to Stalin requesting to leave Russia. Three days after the telegram, we were allowed to leave. Our ships, barges and all our belongings were confiscated by the Russians except our basic clothing. We were left with only a few personal items and one or two changes of clothing. 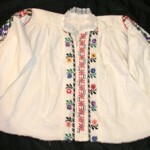 I was three years old and used to wear a traditional Serbian blouse and skirt that my mother had hand sewn and embroidered for me. 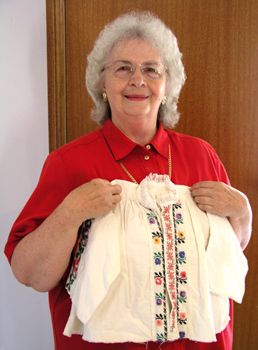 I still have the blouse today. I also have the full traditional costume that my mother used to wear on our travels; I believe she made the skirt in 1926. 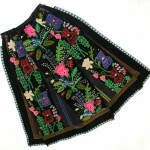 The embroidery is stunning with wonderful colours used in the flowers. These clothes stayed with us through all our travels. Eventually we left Russia, and then our travels began once again. We travelled through Iran, Armenia, Turkey, Syria, Lebanon, Palestine, Egypt and finally to Australia in 1948. We travelled by train through Iran and when we were crossing the mountains, the train derailed. Luckily for us it fell into the side of the mountain. If it had fallen the other way, into the ravine, we would have all been killed. Next was Armenia. I remember dancing the local traditional dances with the young girls. For me the travelling was mostly an adventure. The only things that frightened me were being hungry and the bombs falling. That was terrifying. …because it was so cold and I was young and a little malnourished, I became very ill. In Turkey I caught measles and chicken pox and because it was so cold and I was young and a little malnourished, I became very ill. The chicken pox would not come out because it was too cold. The British doctor on the train treated me when I was sick and isolated our family on the train. We were sent to a hospital in Aleppo, Syria. The rest of the refugees continued onto Sukulgar in Syria. At the hospital I was unconscious for several days. When I awoke I asked my mother what all the lights around my bed were. She told me they were candles that the nuns held while praying for me. When I was in hospital, three Australian soldiers came to visit us, but we did not know they were Australians until some years later when we recognised the hat! They brought us a full sack of tinned food and also gave us three blankets. Two were pink for Mum and I and one was blue for my Dad. I even covered my children with these blankets years later, they lasted a long time. When I recovered we were reunited with the rest of the group in Syria. We travelled onto Lebanon and it was here, in Beirut, that all the sailors were ordered to join the Royal Yugoslav Army under the British command. This was very good as the sailors, including my father, were receiving £5 per month from King Peter, until Tito was recognised as the new ruler of Yugoslavia and then the money stopped. And so we were stateless once more. The huts were brick, white washed, and the sand was so beautiful. We did not know where to go or what to do. We requested to leave through an officer my father had befriended and were then allowed to travel from Lebanon through Palestine to Egypt. We settled in a Displaced Persons’ camp in El ‘Arish, Egypt in 1945. I was eight years old. The huts were brick, white washed, and the sand was so beautiful. There was a school there as well. We were here for three years, living in huge desert tents; there were four families living in our tent. From El ‘Arish we were sent to another Displaced Persons’ camp called El ‘Shatt near the Suez Canal. We were here for three years, living in huge desert tents; there were four families living in our tent. The desert tents had seven linings to keep out the cold night air but because we did not have any money to buy clothes we would take one of the linings off and make shorts or a skirt. There was always someone with a sewing machine! The bamboo reeds that held the walls up, they were covered in a soft, sock like fabric. We would take the covering and pull it apart and use this to embroider, knit jumpers or crochet pillow covers, doilies or collars. My father made a spindle for me from the bamboo reed posts in our desert tent. I used the spindle to make knitting twine out of wool. 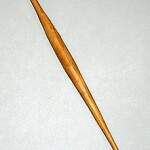 My spindle was smaller than a normal size because I was still a little girl and it was made especially for me to use. 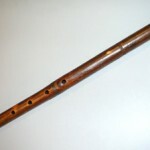 From the bamboo posts in our tent, my father also made a wonderful bamboo recorder to play music on. He would play all different types of Serbian music. I especially liked the folk songs he would play and would dance to his music. 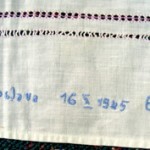 I made my first sampler in 1945 in El Arish. I used a men’s handkerchief because we had no other material. I went to school there and learnt English and Serbo-Croatian. That was quite a fun time for me. 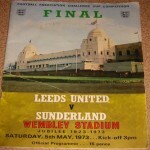 As a child I enjoyed it, but I think my parents were sad. We were basically lost. We couldn’t go back because of the Communist regime so we had to move forward. The Australian delegation showed us beautiful films of Australia: the farms, the different fruits, the merino sheep. The Displaced Persons’ camp was run by a Mr Stevens from Australia, under the auspices of the International Refugee Organisation. In 1948 there was a lot of disruption in Egypt and they wanted the British out so we had to leave. Our choices were to go to Italy, America or Australia. The Australian delegation showed us beautiful films of Australia: the farms, the different fruits, the merino sheep. Most people came to Australia and there were about 800 of us who decided to go. We departed from Port Said and travelled for 28 days on a ship called the Wooster Victory. I was 11 years old and overall I enjoyed the trip. The cooks were Italian, so we ate a lot of pasta and sometimes I got seasick in the heavy storms. …when we crossed the equator, all the children had Mr Neptune come and bless us! The Wooster Victory had been a soldier transport ship so the bed bunks were all in an open room but we were squashed in like sardines. They had women and children in one area and the men were in another area. We had to have drills in case the ship sunk. I remember very clearly when we crossed the equator, all the children had Mr Neptune come and bless us! Because I was travelling with most of the children I went to school with, I was not lonely. I just thought it was a great adventure. 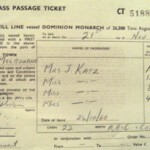 We disembarked in Melbourne on 17 November 1948 and went by train to Bonegilla. We arrived at night. The air was crisp, the grass was tall and all the mosquitoes were out singing; we all had mosquito bites the next day. We were told that we were the second group of migrants to arrive. The food was bearable at Bonegilla, there was a lot of mutton. Gradually, people were sent away to work and so there was less and less of my friends at Bonegilla. My father refused to sign the two year work contract because he had been promised that he would only have to complete one year by the international Red Cross that had sponsored our group. We were promised special treatment because my father was an ex-serviceman. I used to help my mother in the kitchen, reading the English recipes for her to cook. We received a farm job at Bowna, 60kms from Albury and we went there as a family together, just as my father had argued for. I learnt to ride a horse and a bicycle and I did my schooling by correspondence. The farmer’s wife was my schooling supervisor. I used to finish one week’s work of correspondence school work in a day so I had plenty of time to help out around the farm. I used to help my mother in the kitchen, reading the English recipes for her to cook. My father became sick; he had very bad dermatitis from milking the cows and ended up in hospital. We could no longer live on the farm but Bonegilla said they could not take us back because we had left. We ended up at the Albury Police station because the farmer did not want us back. I was interpreting for my parents because they did not have enough English. We were very distressed. The kindly police officer noticed the ex-servicemen’s badge on my father’s lapel, so he rung the RSL and we went there. The RSL manager got in contact with Bonegilla and they sent a car to pick us up. 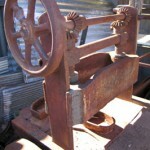 My parents ended up working as cleaners at Bonegilla and eventually we bought a small house in Wodonga in August 1950. Our home was just one room and had a slow combustion stove with no running water. We had no electricity for a long time and I used to do my homework by gas light. 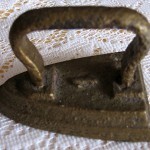 We did all our washing in an old copper. I have very fond memories of living there with my parents. My father got a job at Mylon’s washing the buses and my mother got a job at the woollen mill. I went to Wodonga Higher Elementary School and loved it there. I completed my schooling up to fourth form and then got my first job at the ANZ bank. I married when I was young and married a Serbian man; we had five children, three girls and two boys. My first marriage was very hard and lonely. When our children were older we divorced. I changed jobs and I ended up working for two different solicitor’s firms over 20 years. Ten years after my divorce I married John and now I’m happy and supported. I have eleven grandchildren and seven great grand children. 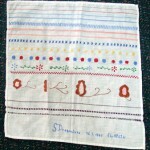 All my daughters have learnt to embroider or knit but one daughter especially enjoys this. This skill has been passed down from generation to generation, from my mother to me, to my daughters and now to my granddaughters. 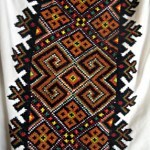 Embroidery is a belonging that stays with you because it is a skill you learn. Nobody can take that away. This Belongings record is part of a collaborative project between the Migration Heritage Centre and Albury City.